Optima 40 Compact is Jam Free Guaranteed and low force. It staples 40 sheets and is sized to perfectly in the palm of your hand. Flat clinch operation forms staples flat for neater stacking. Top loading, holds a half strip of premium staples. Durable metal build. Black and silver. 100% Performance Guaranteed. 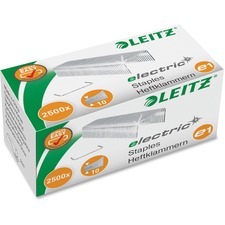 Made of extra-strong steel, these e1 Electric Staples are optimized for use with Leitz electric staplers with a 10-sheet capacity. Staples have a 4mm leg length. 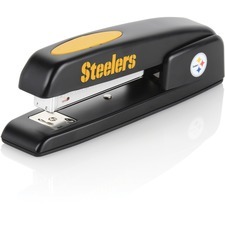 Special edition stapler features the colors, name and logo of popular NFL teams - choose your favorite. The stapler is the 747® business model featuring durable metal construction. Staples 25 sheets and includes tacking and pinning functions. Use with S.F. ® 4® Premium Staples. Limited lifetime warranty. Portable electric stapler fastens up to 18 sheets using standard staples. Design features a 3/8" throat depth, extra-wide paper lead-in, a 45-degree staple angle, 105 staple-capacity and low-staple indicator. Motorized electric stapler uses four AA batteries. Compact, handheld stapler with compact, ergonomic styling provides comfortable stapling to fasten 2 to 35 sheets with ease. 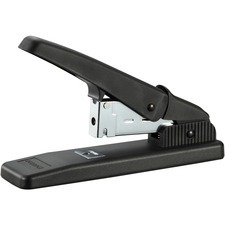 Twin-lever mechanism reduces stapling effort by 50 percent and delivers a flat-clinch stapling finish. 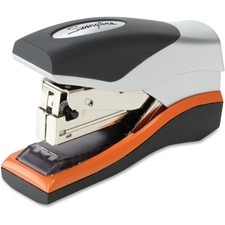 Stapler also features a built-in staple remover and uses the MAX No. 11 staple. This revolutionary No. 11 staple can penetrate 35 sheets due to the lightweight thickness of the staple wire. Staples are easy to load. The top cover opens easily to load up to 100 staples. Stapler is made of a high percentage of plastic content. 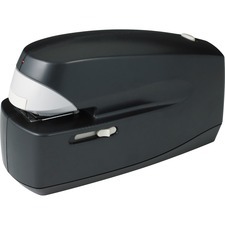 Durable electric stapler with patented cartridge stapling technology staples up to 90 sheets. Staple 5,000 times before replacing the staple cartridge. Each new cartridge replaces worn parts. Flat Clinch technology reduces paper stacks by 30 percent. Low-staple indicator alerts you when you need to reload. Stapler reloads from the front. Extremely quiet, low-vibration operation is designed to perform at least 500,000 stapling operations. 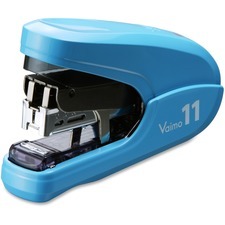 Compact stapler delivers heavy-duty stapling in a space-saving design. No-Jam technology prevents staple jams during projects. 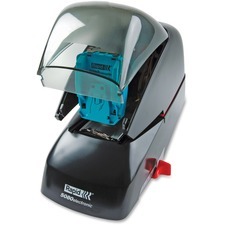 Nonskid base provides desktop protection and stability during stapling. Perfect for work, the home office or school, stapler fastens from 2 to 60 sheet capacity and uses Bostitch SB35 Heavy-duty staple sizes: 1/4" (2 to 25 sheets) and 3/8" (25 to 60 sheets). Optima Grip staples 20 sheets Jam Free Guaranteed with Optima Premium Staples. 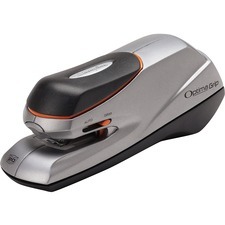 Fast and quiet, this electric stapler works automatically or user-controlled. 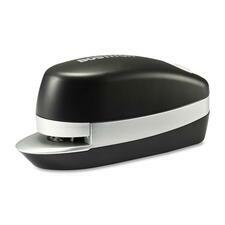 Ergonomic for desktop or handheld use, stapler includes a QuickLoad™ feature and runs on AC adapter or 4 AA batteries. Limited 2 year warranty. Electric Stapler fastens 25 sheets at a time. Features simple push button operation for front staple loading and stapling depth adjustment. Low staple light shows when stapling supply needs to be replenished. Stapler has a 35mm throat. Uses a full strip (210 staples) of standard 1/4" staples.